Coastal Contacts is giving away a free pair of glasses for men, women or children when you use the coupon code FIRSTPAIRFREE at checkout. This coupon code covers standard lenses, so there is an upgrade for coating and/or higher index lenses. You will need your prescription and it’s a good idea to know which lens width looks best on you. This number can be found on the side arm of your current glasses – or you can go to the store, try on some glasses and get a sense that way (that’s what I did). A number of you have reached out to let me know about this offer – thank you. I held off on posting until we could check it out ourselves. My husband got a pair of glasses, assuming they’d be back, but liking them so much they are now his everyday glasses! What a frugal option for glasses (even if it’s just for a back-up pair)! Again, if you need super high index lenses (like I do), you will pay for that upgrade. But the cost still works out to be 1/4 or less what I’d pay at even Costco for new glasses. One last tip: Coastal Contact’s stock changes over quickly — and their frames do sell out. So, don’t leave a pair in your cart for a few days while you think about it. It’ll be gone once you decide to order (she says from personal experience). 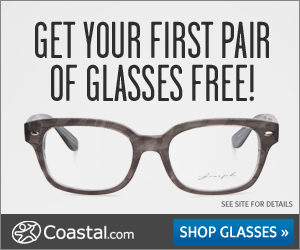 Order your Coastal Contact free pair of glasses. Do you know how much extra it is to get the silver package? The price is $40, a difference of $20 from the standard lenses, but do they charge you $40 or $20?